Home » General News » Huge News! Premium Calendar for Everyone! One of our goals when we started Digital PTO was to make sure that as our memberships grew and as time went on that we would continue to release new features for all of our plans, including the free plan. Today we are very excited to announce that every single one of our members, whether you are a paid or free member will now have access to a high end calendar on your PTA / PTO website! The update will be rolling out on July 28, 2014 throughout the afternoon. And this isn’t just any high end calendar, this is the calendar that our Premium Plus Members have been enjoying for years. It’s our top of the line calendar – and now it’s built in to every website on our parent group network! 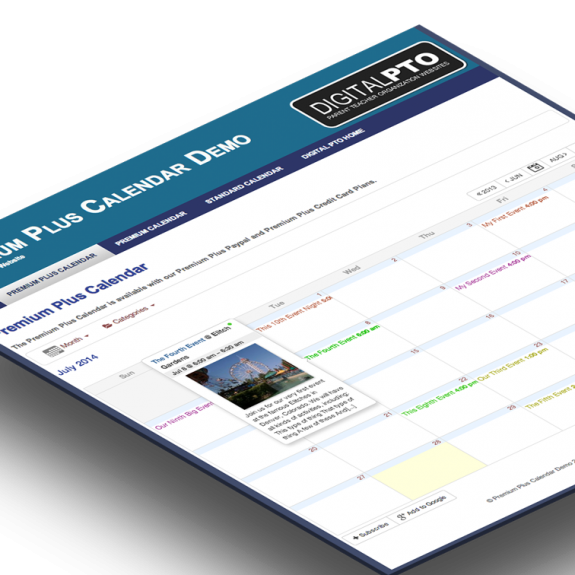 This Premium Plus Calendar is loaded with features like event categories, customizable sidebar widgets, recurring events, multiple views, event venues, featured images, organizers and tons more. Your advanced users will love being able to subscribe to your groups website calendar with the click of a button. The events are easy to manage and maintain, you are going to LOVE this new feature. For those members that are currently using one of our older calendars (Standard or Premium Calendar) you will have the option to continue to use your current calendar for the time being, or you can transition to the new calendar with just a few clicks. Please note that you will need to enter your events onto the new calendar, the older calendars do not share data with the improved calendar. Digital PTO has been the leader in providing Free Parent Group websites for the past 4 years and this major enhancement to the service is one more example of our commitment to PTA and PTO groups across the country. Digital PTO takes parent group communication and organization to the next level. We hope you love the new Events Calendar as much as we do. We can’t wait to see what you can do with it! Comments Off on Huge News! Premium Calendar for Everyone!